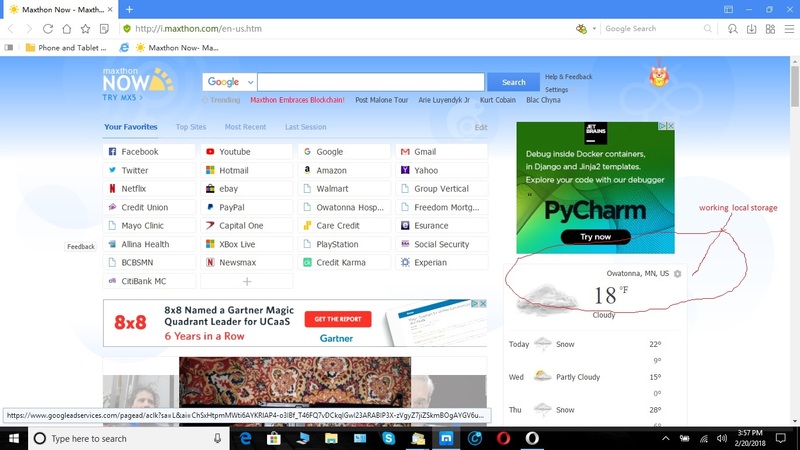 I have installed Maxthon 5 on several customer computers and the 5 Day weather does not ever load. For some reason that section of the page only displays "Loading" but it never loads any data, just "Loading". This has happened on about 6 laptops and PC's. 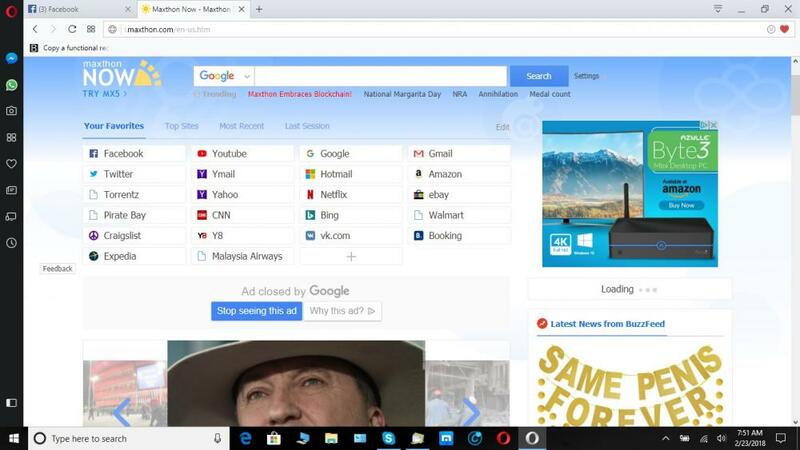 I try to get my customers "switched over" to Maxthon but ended up installing Opera since I.Maxthon.com start page does not load 5 day weather. I can take my http_i.maxthon.com_0.localstorage from my personal computer where 5 day weather does work and copy it to another PC and the weather will load, but I cannot use this since it has all of my stored Favorites Links. Can someone provide a fix for this so I can go back to using Maxthon on my customer computers? the 5 Day weather does not ever load. I'm surprised such a feature would be the deciding factor on whether to use the browser or not. Seeing as this has been brought up before, I'm guessing you tried with ABP off? and testing on the same system using a guest account and/or portable version? Can you check the devtools console (F12 > console tab) for any errors showing. Post results here. Also check the elements tab for the <div id="weather"> section and post here as well. Well, yeah, customers like to see news and weather on their start page. If something is missing they don't want to use it. Like buying a car and the headlights don't work. It isn't in the adblock otherwise the copied http_i.maxthon.com_0.localstorage weather feature would not work. I will have to wait until the next time I need to do install to get you the errors. If i recall, there was an error related to google and 2G networking, I think related to a "write" document file. The google page that the link in the error is where I read the 2G issue. There seems to be 3-4 errors but can't remember. I remember clicking on a couple links in the errors and got an error 404 message. I don't know if those are related or not. I am not a developer so all this is not in my realm. I am just a user and expect things to work. When I report an issue that occurs multiple times on multiple computers, I would hope someone could review and try to repeat the installation issue. In the mean time, I will continue to copy my personal http_i.maxthon.com_0.localstorage and remove my links when installing on customer computers and get the errors on the next install if it occurs. Right now I am about 4-5 on this issue in the last couple months. If possible can you PM me the files from one that works and one that doesn't? Here are the errors in Developer tools. 2en-us.htm:41 A Parser-blocking, cross-origin script, http://w.cnzz.com/c.php?id=30098323, is invoked via document.write. This may be blocked by the browser if the device has poor network connectivity. See https://www.chromestatus.com/feature/5718547946799104 for more details. When you look at the file, do you look at the code or try a new install and copy the file to "lacal storage" try it or trying a fresh install? I am running Win 10 latest version of 1709 and MX 5.1.6.3000. As far as i can tell it's not the file that is the issue. So based on that i'd say there's something not being loaded properly, or somehow being blocked. Strange. I am having this happen on older Win 10 machines and brand new machines. I am hesitant to send the the working file since, from other topics about cookies, that file will contain my links and passwords for i.maxthon.com. I guess, I could delete all my links then save that local storage file and send it to you then recopy my backed up working file back in. Well, that didn't work. I removed all the links in the "My Favorites" section and now 5 Day Weather does not work. "Loading" is all that shows up. Ok, I got it, I had to leave one link, in order for it to work. Here it is. that file will contain my links and passwords for i.maxthon.com. There's no links in the file that i can tell, and there's definitely not passwords. The local storage file I just posted will only have one yahoo link with no password. first time I tried deleting all links in My Favorites Section on the i.maxthon.com Start Page but 5 day weather didn't work, so I loaded my working file, deleted all but the Yahoo link with no user data or password and 5 day weather is working in the file I posted in my last post. I am trying to understand why 5 day weather is not working on new installations on older Win 10 machines and new Win 10 machines but works if I copy my older local storage file that does work. So I have sent you a nonworking 5 day weather local storage file and a working 5 day weather local storage file. There must be something different between the two files since one works(old file from my machine) and one does not (new file from my machine). This has happened on the last 4 or 5 machines, all Win 10, that I have installed Maxthon 5 on. Here is the result of the Old Working file and the new installation nonworking files. The new file in this case allows to enter the zip code. On other installations there is no option to enter zip code only an ad as shown on the working file. I made one more trial. 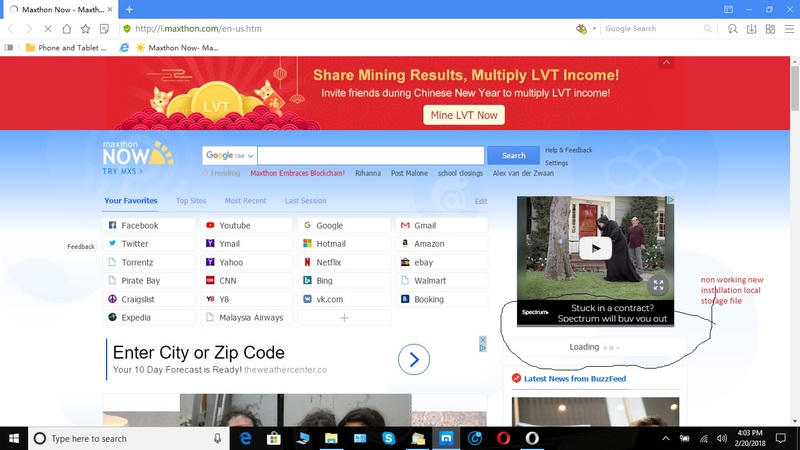 I opened Opera and went to I.maxthon.com. It seems the problem may be in the web page code. Here is what I got just opening the web page.